We had a storm here recently. A big storm, or perhaps simply an unusual one. While the storm clouds rushed down the coast and hail fell, stripping trees and flooding streets - the insurers moaned at the superficial damage to vehicles too pockmarked to repair. A fifty year or never-year event to end the drought, it recalled for me the opening sequences of director Peter Wier's The Last Wave. In the afterstorm I walked my familiar beach where the floodwaters had disgorged their flotsam into the ocean, and in reflexive reflux the ocean offered it back to the high water mark. 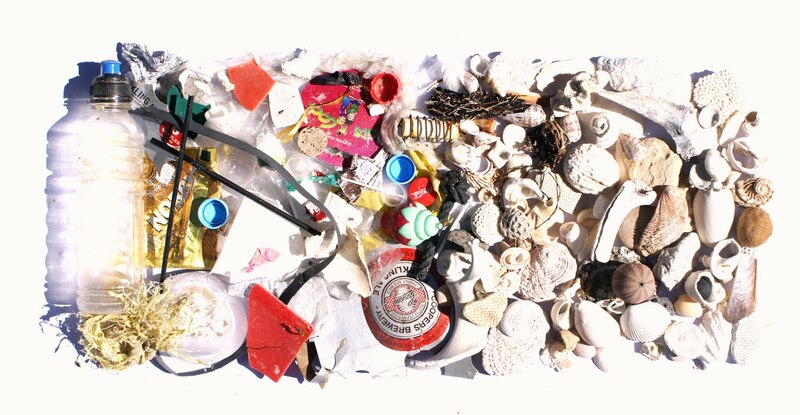 Collecting these artifacts in pollution I pondered what message they had compared to the many 'more natural' forms the sea offers up. I realized then, as passers-by nodded to me in agreement at my collection of the detritus that they had walked past, that in the plastic toys and candy wrappers, the fishing floats and collapsed birthday balloons, the lollipop sticks and beer pack holders that here was the artifacts of life, joy and living from human society. The moments of fishing, the sunset drinks, the happy birthdays and playful games of the end of a summer loved so well. 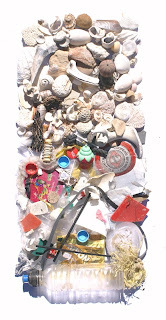 In contrast, my privileging of the natural then fell away and I saw the precious shells, colourful bits of weed, mysterious cuttlefish skeletons and intriguing urchin shells as the remnants of the dead. This which I usually cherish as the natural, the beautiful and the living, was nothing compared to the human colour of our creation in wanton discarding. The living sea offers up to us the remnants of its life ... and had returned back to us ours. Both then are placed here in contrast, collected from the same beach, in an artifact of the divine. It is, however, more than this, because in this small snapshot is a microcosm of human and marine living taken from the transition zone of their sharing. This fractal picture is of two worlds converging in the arti-fract of our, tenuous co-existing, love of life. ... what a gift this day of a novel seeing.